‘Away from it all’, ‘a wonderful sea view’, ‘an idyllic location’ and ‘well-maintained’ are all terms that can be fairly applied in a bid to describe Cae Du. But it’s not enough, and to see this place for the first time, approaching from the north, on the A493, your little heart skips a beat or two. 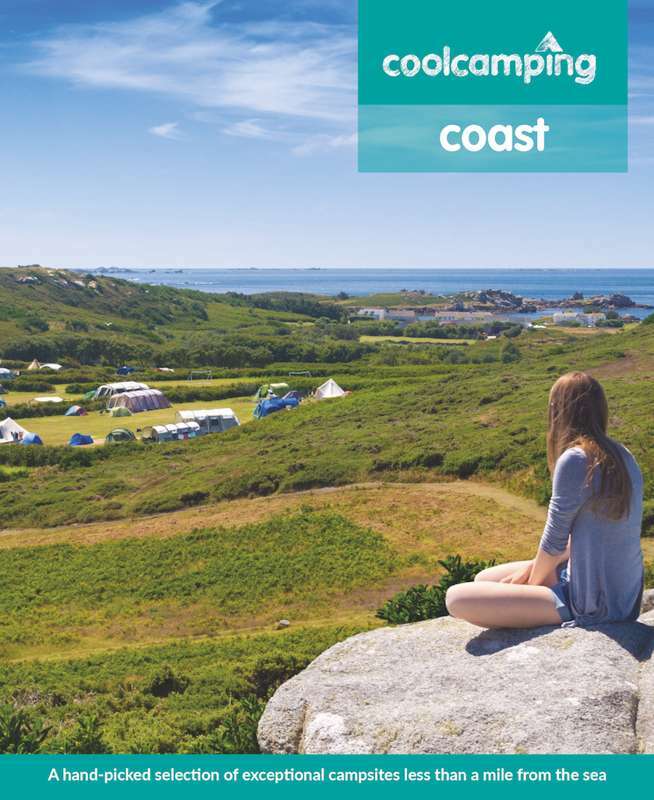 For there, a couple of hundred yards below, lying right next to the sea, with an unspoilt landscape enveloping the site, is the campsite of your dreams. It looks like a place that has become detached from the real world and it proves to be just that. If all you want from your camping break is a sea view and an escape from the mad world we all live in, then this is the perfect place to unwind to the rhythms of the waves and the tides. ‘Idyllic’ is a word that is used far too often, but it sums up the situation of Cae Du as no other word can. But while Cae Du is an escape route from the rat race, it isn’t so far removed that there is nothing else to do, if staring out to sea doesn’t hold your attention for the entire holiday. Or if the children start walking around with placards round their necks protesting their need for action. Or if the weather turns a bit wild on this exposed stretch of coastline – which it can do. It’s about a mile to the nearest station on foot and from there a whole new world awaits you: Shrewsbury, which must be one of the most handsome old towns in Britain; a short hop of three miles to link up with the very scenic Talyllyn Railway; or in the other direction there are all manner of destinations. The small, time-warp seaside resort of Barmouth (Abermaw) is one such stop travelling north – it still has donkeys strolling the enormous beach and colourful swingboats rocking back and forth. The Mawddach Trail, which follows the course of the disused railway from Morfa Mawddach, near Fairbourne, to Dolgellau, is one of the most enchanting walks (or bike rides) anywhere and, with tide ebbing and flowing, the place never looks the same from one minute to the next. And this is the thing – whatever you want to do with your camping break, it won’t be far from Cae Du, even though it seems to be placed in another world. Really the title sums it up. It was one of those moments that I will never forget; sitting underneath a star filled sky with the Milky Way directly overhead, a campfire crackling, the waves crashing onto the rocks just six feet below, the lights of Barmouth twinkling in the distance and a belly full of the farm’s own lamb burgers. It really doesn’t get any better than this. The campsite is so relaxed it is unbelievable, all the pressures of life just melt away within minutes of arriving. The hosts offer an incredibly friendly welcome; even the dog made friends with one of the farm’s sheep dogs that kept running down to us and taunting her. The local train running at the back of the site only adds to the charm of this idyllic setting. If you plan on walking the beach then cast an eye over the tide table in the utility room. This is a place we will just keep returning to over-and-over again. 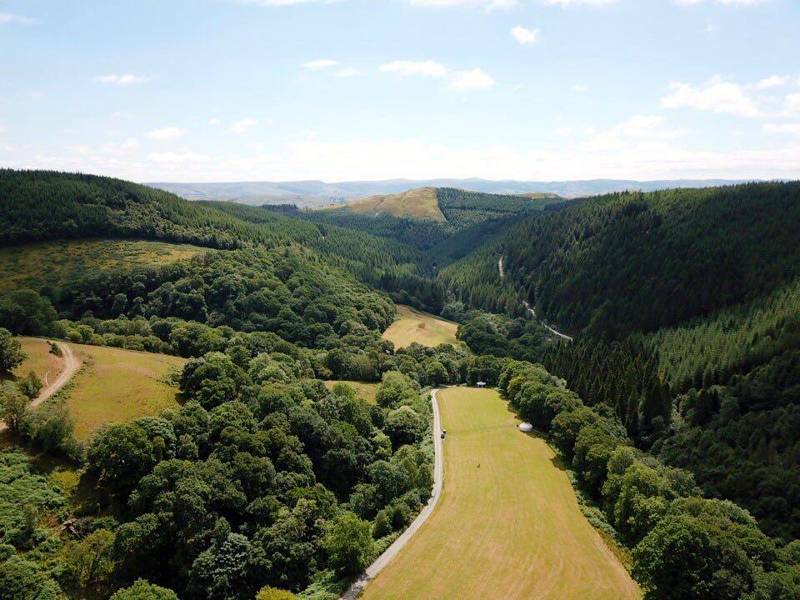 If your idea of a campsite is ‘check in/check out whenever’ and ‘find a spot you like and that’s your pitch’ coupled with stunning views then Cae Du is absolute perfection. Welcome was friendly and efficient. Basic but adequate facilities - they do what they're meant to - kept clean and tidy. (would be even better if treated and respected properly by campers - especially kids!). Awesome panoramic views. Pitches fine - website makes it clear what to expect so no surprises. Firepits an added bonus and in the afternoon the farmer/owner comes around with a truck full of logs for £5 - well worth it. Our bundle lasted 2 nights but they are BIG logs so might be worth having something with which to cut them down; also handy to have kindling and maybe cheat with firelighters! VERY strict about dogs but you have to remember that this is a working farm first and foremost for the owners; this also probably accounts for the 'basic' amenities. (they are perfectly acceptable - clean and tidy, maintained - and just about cope with the volume of campers). We would definitely return as this suited our needs perfectly. Website is very honest and representative of the site. Miserable "welcome"! by the owners but the campsite has amazing views. If you like to camp likes its a festival [tents nearly on top of each other] as cars not allowed by the side of your tent, they must be parked at the front or back of your tent so they can get as many people in as possible. Owners drive around to make sure you are obeying his orders but if you do then the site is lovely.The washing up area could do with a good tiding up but has the best view when washing your pots and pans. Well worth a visit if you like meeting people cause they are literally sleeping within breathing space. Could not be happier with this campsite. We started here for our ten day holiday at three different locations in Wales. Owners were lovely, toilets and all facilities were all clean. Showers a little on the expensive side at £1 a go but there was plenty of time for me to shower myself and my 4 and 6 year old. The beach is fantastic for rockpooling and the local towns were friendly and beautiful. As you'd expect next to a cliff its a bit hit and miss finding a flat pitch but the fantastic views and sheep roaming the campsite more than made up for natures undulations! Clientele were like minded families and individuals. Ran out of time to sample the lamb burgers so we will have to return. Thoroughly recommend. We had a lovely stay here - the owners were relaxed and welcoming, the site was beautiful with stunning views and next to a brill beach to explore. Lots of cycling, mountain climbing, ice cream eating and exploring very close by. Facilities are simple, clean and have everything we need. Loved it and will return! Very nice view. It really was nice for the first morning unzipping the tent and revealing the beautiful sea view HOWEVER after the first night the feeling had dissipated and I just wanted a decent shower. Unfortunately, I could not have one! And with there being one sit down toilet shared between over 100 people (men's toilets) taking one of the three S's was not a relaxing option that I decided to pursue. It was £1 a shower, which wouldn't be much of an issue if they were clean and hot. What frustrates me is that we were charged more than family we were meeting. £22.50 a night is expensive for a camp site- unless you're particularly fond of your sea views you get better showers, just as nice mountainous views for a quarter of the price! The owner just seemed greedy and if you read other reviews this site could be so much better if a bit of effort and customer service was attempted. Once you arrive the owner will come straight out and ask you to be paid. This site is just a view, you can get better for far less elsewhere. The site itself is fabulous. Cant get more of a sea view than this, it is fantastic watching the sun setting in front of you with the haze of snowdonia in the background. Facilities are perfect for a basic site, everythin you need and very clean with it. Fire pits are a great addition and the friendly owner was always on hand and obliging. My only downside is nothing to do with the site but the lack of walks and amenities near by. The coastal walk was disapointing as it was very nearly all via road and followed the wrong side of the train track so no sea view till you reached Tywyn. This is the first time you also find a pub or restaurant so not really able to walk here of an evening as its a 7mile round trip. That's my only qualm, you have to drive to all the pubs which defeats the object of a pub if you fancy a few alcoholic beverages. Despite this and the fact it can get pretty windy on the exposed beach I can recommend anyone a visit and you will not be disappointed. Facilities - kept nice and clean. Always well stocked with toilet tissue, hand wash and even a Dyson air blade hand dryer. Showers cost £1 - really lovely powerful and hot. Washing up in the kitchen area is also easy with hot water - washing machine and tumble dryer (for those ramblers) and two fridge freezers. The owners are funny - Welsh dry humour at its best. You can buy firewood from them (£5 a bundle) which kept our fire going for a few good hours). Camped here a couple of times. Great that you can pick your own spot and plenty of firepits available. Can get busy over weekends in the summer and if you are away day-hiking your tent can be completely 'swallowed' by big groups with lots of tents. Usually people staying quite relaxed though. Very basic but adequate facilities.Tywin nice little town with fab beach. Great hikes nearby. Cae Du - Idyllic Views/Perfect get away from it all site. To get onto the site you have to come off main road, past farmers cottage then drive down through some gates until you reach the site which by having no direct walk through access we felt more security for our eleven & year old daughters and what an impressive view the site has regardless of which side of the site you choose to pitch. Whilst there we were blessed to see the Dolphins swimming & doing graceful somersaults in their natural environment. If you want to get away completely from the hustle & bustle of everyday life & get back to nature, complete tranquility & reawaken your senses to the stunningly beautiful natural views, ocean, stunning landscape & wildlife Wales has to offer this is definately where to stay. Views are wow but site facilities don't even hit mediocre! Need a proper deep clean and repairs in toilet block! Very Very Very expensive for a basic site. Would not stop again which is a shame as it could be a 5* site with a little work. Was very busy and noisy whilst we stopped and because pitches aren't allocated some tents were pitched so close to use that their guys almost crossed ours. Site is very exposed with not much shelter but you do expect that on a site so close to the sea. Also most pitches are sloped, so much so that you start off the night one side of the tent and wake up opposite. Seems a shame that such an amazing location hasn't had more care taken with it and a little investment could make all the difference. Had no problems here, lovely site, grew up a couple of miles away but still love getting away from it all down here. A little foraging in the boulders can produce a tasty starter. Just got back from a two night stay here, it was beautiful! The owners are friendly and very nice! Very clean facilities and really impressed with them too! Showers were lovely and hot! Just back from spending Spring Bank Holiday at Cae Du. Absolutely beautiful site. Sitting by the camp fire watching the sunset was a glorious, glorious treat. The site was busy, as to be expected on May Bank Holiday but it didn't feel cramped or overcrowded, there was still a decent amount of space between pitches. The owner was friendly and welcoming, charged us £15 per night, and helpfully warned me to wash my hair first in the shower in case of time running out, though in the event it turned out the showers worked well and warm for the full 6 minutes £1 bought you. Facilities were beautiful and clean - 3 or 4 times when I popped down to the amenities block over the weekend someone was in cleaning, so they never got the chance to become muddy or untidy and there was always a full complement of soap and loo roll etc. Beautiful place to stay, I cannot recommend it highly enough. Perfectly placed for walking - we did Cadair Idris (stunning) and a chunk of the coast path over the weekend, though you could cheerfully amuse yourself mucking round on boulders on the beach if you didn't fancy going far. The Peniarth Arms in Brycrug does cracking food, too, if you can drag yourself away from the view. We just came back from 3 days at Cae Du. The views are absolutely stunning, photos and reviews can't really do it justice. I loved waking up to the sea view outside our tent every morning and watching the sunsets - which are incredible. Being able to have open fires is great especially as they sell wood there and bring it up to you. The toilets, showers and kitchen were always spotlessly clean which impressed me as it was a busy bank holiday weekend / start of half term. I guess there's an element of luck with who else is camping but we found the atmosphere was relaxed and were lucky enough to have helpful neighbours. They came and helped us pitch our tent as it was pouring with rain and we were obviously struggling - a different set of neighbours also helped us get our fire going ! The family running the site were friendly when we spoke with them or needed help with something but other than that they let us get on with our holiday. AWESOME! Starts with a fantastic host, friendly and welcoming and moves onto stunning views! Every pitch comes with their own rock built fire pit and the host will even deliver you wood and kindling. At 7am I was lucky to see porpoises jumping out of the sea. A special place with great views and a really chilled atmosphere. Definitely going again and again and again. If you like simple camping and prepared for the reality of camping on a cliff then this place is just fine. We were fortunate with some sunshine and gorgeous sunsets. This is the best site, we travel 3.5 hrs to get there! I first visited this site on recommendation of a stranger when chatting about camping, I have since taken several people including my children, my son and his girlfreind my partner (who had never been camping before and is now having withdrawals and is desperate to return to Cae Du this year). This site never fails to deliver, there are pithes on the cliff edge or further back if you don't like the idea of waking up to smelling and hearing the ocean. This is the edge of the country and you feel so alive while your there, the farmer is super helpful, he brings wood for your open real fire at night, they also sell lamb burger made themselves (delicious). There is a sheltered area to eat when raining if your tent is not sufficient there are showers and toilets (all clean) there is even a sink and warm water, solar panels are used to heat the water and the beach is literaly a stones throw away, the pictures do not do it justice, I am guilty however of not sharing this site with my friends who camp who are groups of lads or who don't value the outdoors, it is one of Britains beauty spots and I want to keep it that way so it is an escape and a secret. If you watch the sea you can see the Dolphins go past and return later in the day when in season. 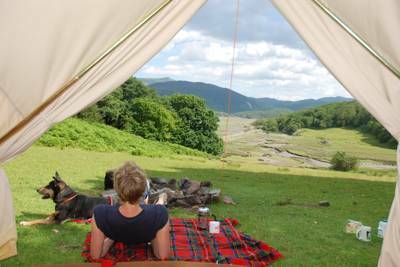 If you love the outdoors and want to share an amazing experience of camping with family and friends whilst enjoying some of the best views available then this is one to try, you will love it! but please don't share with the rowdy crowd, I love to party as much as anyone but as the tranquility is part of its appeal respect the area. The reviews which state it is over priced obviously have not stayed in the lake district, I live 40 minutes from the Lakes and travel 3.5 hours to get to Cae Du, nothing compares to the views, pitch on the left hand side of the shower block on the cliff edge for the best views and experience, find your fire pitch and enjoy!. A warm, friendly site, nothing too much for the owners who were extremely helpful and friendly. Excellent facilities kept spotlessly clean. An up-to-date folder was available in the washroom detailing local walks and places of interest. Very useful indeed. A friendly atmosphere was clearly evident. 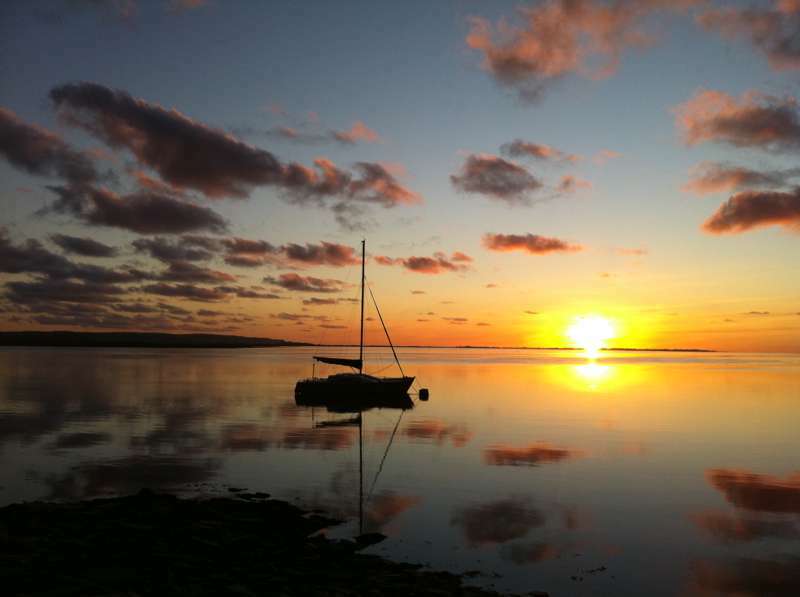 Fantastic sunsets, wonderful night skies, a busy but quiet site with plenty to do and see. Dolphins and seals were an added bonus. Will definitely visit again. We picked a week at random to tour the coast of Wales and it turned out to be a week of Mediterranean weather, this campsite was stunning. Swimming in the cool, turquoise sea (seriously), enjoying the shearwaters playing at night, watching the stars around the campfire. The hosts were warm and fun. The facilities more than adequate. Little piece of heaven. Might be worth Cool Camping please updating the information this site: it currently says that a tent + 2 adults costs £10. However, I've just called this site to see if they have any availability for the August Bank Holiday weekend. I wanted to stay with my partner, in our 4m bell tent. The lady was vague and unenthusiastic. After some deliberations with her colleague in the background, she came back and said that they would charge us £30.00 per night to camp! When I asked on what basis this had been calculated, I was told that a normal 2-man tent would cost £15.00 and a "family" tent £25.00... Seems they just make the prices up as they go along, to get as much off you as they can. Despite the pictures (this site looks gorgeous), this call seemed to confirm many of the reviews that suggest this site is unfriendly and over-priced, so I decided not to bother staying here! Stayed here Sunday 21 July in VW Camper and we're quite new to camping as have only stayed on 1 site prior to this; we loved it. The coastal views right on top of the sea and cliffs etc were fab, it had a good atmosphere around the site and there were ready-made stone and rock camp-fire's to use (you can buy wood from the farm). We had a bike ride around the coast (which was a challenge as it's very hilly in the area), seen some seals around the coast and the views were amazing, the fantastic weather made all the difference; spent some time exploring Barmouth and some delcious fish n chips before heading back to Cae Du for the afternoon to laze in the hot sun with a beer before our BBQ and camp-fire as the sun set. Apparently the atmosphere the previous night (Saturday) was brilliant with all the campfires burning and a great vibe, so would include a Saturday night when we go back. The toilets and showers were basic but clean, with adequate indoor dishwashing area and an indoor chilling area. The campsite is approx 5 miles from Barmouth a lovely little seaside resort with great beach (over the Mawddach footbridge) and 4 miles from Athog where there is a great bike track which goes from Barmouth to Dolgellau. My experience of this campsite was very good. You've read all about the location and it's all true. Views are great, there's nothing else around in the area (although trains do pass right by the campsite in the daytime) and you can have fires/bbqs/whatever you want. In fact, there seems to be almost no supervision of the campsite at all, which you may view as good or bad. There are certainly no noise/fire wardens! I went at a bit of a strange time - I arrived on the Bank Holiday Monday as everyone was leaving! So although it was only half full when I got there, by mid morning it was virtually empty, so I could pick one of the best spots with a view of the sea/sunset. The facilities I found to be above average - good showers (yes, they cost a pound but it buys you plenty of time at a nice consistent temperature), clean toilets and sinks. Clearly I went went when there was no-one there, so I can imagine it *could* get messy/muddy at peak times and in the rain, but what campsite toilet wouldn't? Sheep were roaming free in the field - not a problem to me but when it's packed the mess might be an issue. The people running it were pleasant to me - didn't get off to the best start when I was a bit confused as to where to park up to go and check in/pay and tried to go through the gate, but when they realised I wasn't trying to get in for free, they were fine! I don't think customer service is their thing - they're not hosts or all smiles/pleasantries but they answered all questions, helped me out with a couple of tourist enquiries and that's all I can ask, really. They're there to look after their farm and I suppose when it's really busy they could get exasperated with running the whole thing (from the sounds of some reviews) but I think they're good people, just not customer service reps! If your expectations are realistic, you won't be disappointed! Overall, then, I think if it's sunny and warm and quiet, like it was for me, then you will have a great and relaxing time. If you try to go camping on a bank holiday on a wet/cold weekend, along with half of Britain, then expect to have issues with pitches/toilets/mess just like any other campsite you may have chosen to visit! I think some of the reviews here fail to seperate the campsite from the actual issues (trying to go camping when everyone else is!) and criticise it unduly. I'll be back sometime. A more welcoming approach and maybe a few less sheep would make it 5/5 but I hope you'll have a great time too. We have just come back from 3 day's at this site. We come here every year normally towards the end of the season, however this year we decided to go at the start of the season. What a disappointment. It was £7.50 per person per night in a tent, not to bad what we paid last year, however the field was covered in sheep mess, we had to spend 30mins clearing an area before we could put our tent up, only to find later in the day after going out coming back to find sheep all round our tent and a load more mess to clean up. The showers (which cost £1 a go) in the gents had a broken shower head on which was like that in September last year while we where there. When we mentioned all this to the owner he just shrugged and walked off. It is a beautiful place which seems to be falling behind and relying on the past good reviews this site has had, and needs a bit of investment back, hence while we where there 3 other people said they wouldn't come back until they invest. I've been going to this campsite for over ten years now and have had some amazing times there! Location is amazing and sunsets to die for and of course the camp fires that are allowed make this site something rather special! But in the last two years my thoughts have changed somewhat. Whenever we go even within the same year the prices are always different!!!!!! I'm sure they just make them up of the top of their head. The owner can be rather abrupt at times. Last year we checked in and paid up front in cash. We then went to pitch our tent and halfway through the farmer came bowling over his first words being "have you paid" not "hello guys, good journey down?". We we told him we had, he simply jumped in his landy, slammed the door and sped off! Nice welcome! The toilets and showers need refurbishing and the owner now insists you pitch on top of each other – all this is down to greed, greed, greed! The campsite has enjoyed a rise in popularity recently due to an excellent reveiw in a camping magazine, Given the obscene amounts of cash this guy must have going through his fingers every season (and trust me I've counted well over 120 tents sometimes) at an average of £30 a night! Well over £3500 a night, the least he could do is put a smile on his face and even just pretend to like us campers for the weekend, not to mention ploughing some money back into the tired overpriced showerblocks. It's such a shame to see things have changed so much recently. Been going here for years and made some really good friends from fellow campers who also appreciate what Cae Du gives you. Yes, it`s not cheap and facilities are basic.......and I hope that more people stay away because of it, because I can then get back to enjoying the most idyllic back to nature camp site with fewer people coming!! This is my favourite campsite in the world and I would pay double for the joy it gives me every year. I agree with earlier post, this site is going downhill. We have been several time's in the past, but the 3 times we have been this year have been poor. The 1st time the site had only been open 3 day's & the 2 shower's in the gents had broken shower heads (which were the same as when we last visited the site in Oct), the road down was a spring breaker, and the field was covered in sheep poo. The cost of £7.50 per person plus £1 for a luke warm shower is not very good. We have just returned from our last 2 nights and again faulty shower heads & lukewarm water, tents so close it is a fire hazard & when you complain all you get is take it or leave it. The site is in a great spot & will always be busy but if the owners (they are farmers who are always busy) do not have the time to run the site properly then they should employ someone or stop taking money off people for what is starting to be substandard. Just got back from bank holiday weekend at this campsite. The weather wasn't great but we had a great time. The view from the campsite is fantastic. On Sunday night we watched the sun set on the horizon, it looked like the sky was on fire. It was nice to see all of the camp fires light up the night. We got the train into wales, Tonfanau station is approx 20min walk from campsite. You can walk across the top of the costal path direct into the camp. We would deffinaltely go back to this site. This used to be a fantastic campsite, until it began to great reviews on sites like this. Now it's cramped, crowded and the owners are often grumpy and unfriendly as they are harrassed by people who don't treat them or the site with respect. Our last 2 visits were awful, first we had to camp so close to neighbouring tents that ours was scorched by sparks from their fire. (We moved the tent further away but were told by the owner to move back in the morning). On our last visit we vowed never to return (after nearly 20 years) as loud music until 3am kept us awake and the number of generators running all night (so campers could watch tv and run their fridges) spoilt what used to be a quiet, peaceful, friendly place to spend the weekend. Even the stunning views, spectacular sunsets, proximity to beach and regular visits from dolphins and seals swimming by can't compensate for the noise, dirt and crush. Fantastic site and location. We went on a windless sunny weekend and enjoyed bbq, beers and campfire. Would imagine that if it was windy may not be great as very exposed right next to coastline. There is a nice bit of beach that is only visable at low tide and you have a 5 minute walk over the rocks to get to it & loads of weed so can be a bit slippy so I’d guess if you had very young kids might be a bit of a pain. So if it’s scenery and simple pleasures you’re after you can’t go far wrong at Cae Du. One last thing - we took our 2 WELL BEHAVED dogs - but the owner was a bit annoying as he seemed to go out of his way to point out that they MUST be on leads every second of the day. I’m more than capable of taking responsibility of my dogs. Think the owner should just cheer up a bit and enjoy the stunning views on his doorstep. Location, location, location! Beautiful spot and stunning views, the spot cannot be faulted. We went from breezy near arctic to mediterranean heat over a four day stay and loved it all. We were treated to dolphins swimming by while we supped morning coffee! Facilities spotless and despite half term crowds we never really had to queue. The only reason we’re not giving this site five stars is a bit of a hesitation about pitch proximity; we were told to pitch up as close to another tent as possible "as close as we could without guys crossing". It would be best not to hear your neighbours turning over in bed, but then we did go at half term so I guess we should have been prepared for crowds. A little more space it would have been truly perfect. We paid £15 per night for two people in one tent. Best. Campsite. Ever. It’s in a lovely spot in North Wales with the sea tumbling up to the bottom of the cliffs that you sleep a-top of. Beautiful views in every direction and everything you need from a campsite. Namely, camp fires. They are few and far between these days and it is lovely to find a site where you can light a little fire and cook your supper over it. Plus, campfires always make the beer taste better! As far as the practicalities go; decent, reasonably priced and clean showers. Good indoor room for washing up etc. Ground a bit uneven but there’s usually enough space to find a spot where you won’t end up at the foot of the tent in the morning. Even if this place didn’t have running water and the other little ’luxuries’, I would come back time and again. It’s idyllic. The constant sound of the sea and the slight ’edge of the world’ feeling that you get on top of a cliff probably contribute to the relaxed and invigorating feeling I always have when I come away from Cae Du. Try it and you’ll see! PS - try the lamb burgers, you can’t fault them either...! myself and a friend (both female) read about this campsite on this website. the information stated that it opened in March. we arrived early April, on foot, with our backpacks, but discovered they only open on Easter weekend. we had no transport and it was late in the afternoon. The owner was extremely surly and unhelpful, and refused for us to pitch our small 2-person tent anywhere on their property including on an out-of-the-way path. it would have been a small favor to do for two weary travellers - what happened to welsh hospitality? This is a great campsite. No needless rules and regulations and the price is extremely reasonable. The shower block is ok, no complaints. The showers are not free so you’re going to need a few coppers. £1 a go. We found the showers to be unpredicable, so wash the essentials first. I can’t praise this campsite enough. My favourite by far. This is proper camping. Excellent facilities block with toilets, showers (£1), laundry, dishwashing facilities and 2 freezers for ice-blocks. No electrical hook-ups. Campfires permitted and wood sold on-site (£5 per bundle). 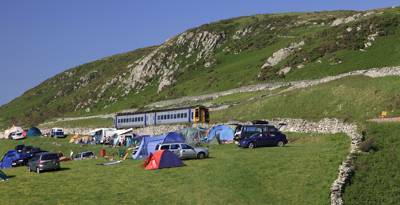 There are several train rides near by; from Tonfanau station, 1 mile south of the campsite, the scenic Cambrian Coast service (08457 484950 [rail only info]) runs to Pwllheli in one direction and Shrewsbury in the other; the Fairbourne Railway (01341 250362) and the Talyllyn Railway (01654 710472). Or if it’s really pouring, head to the little cinema in Tywyn (01654 710260) and catch a film. This isn’t ideal pubcrawling territory, but 3 miles away in Llwyngwril the Garthangharad (01341 250484) is a good, if un-pronounceable, old, white-washed pub and restaurant with exposed beams and all the trinkets on show. 3 miles in the opposite direction, at Bryncrug, the Peniarth Arms (01654 711505) does decent pub grub, too, while a few miles further towards Dolgellau, at Penmaenpool, the George III Hotel (01341422525) boasts a cosy bar, an exceptional restaurant and scenic location overlooking the Mawddach Estuary. It also has good rooms. Single tent or small campervan £10, family tent and larger vans £20. Dogs £2. M54/A5 to Shrewsbury, A458/ A470 to Dolgellau then A493 towards Tywyn. Site is 21/2 miles beyond Llwyngwril. Take the coastal rail service to Tonfanau then hop into a taxi or brave the mile-long walk on foot.